At its core, ROKiT’s mission is based on three fundamental end user values: connectedness, well-being and security. With today’s launch, ROKiT announces the world’s first smart phone complete with the ROK Life services plan, a bundle offering services including a year’s free access to healthcare, discounted pharmaceuticals and international calls for just $59.99. With five stylish black handsets available for preorder, the phones are all unlocked and incorporate the latest Android features available. With a sleek design and premium quality feel, the phones start at $34.99 and include Dual Sim, WiFi calling, WhatsApp, Facebook, Bluetooth, FM radio and MP3 as standard. The smart phones in the IO collection, start at $59.99 for the IO Light, which has a large display screen, 3G, GPS and feature Android Oreo (Go Edition) technology. IO 3D and IO Pro 3D, available for pre-order from $114.99, will offer the latest glasses-free naked eye 3D technology. Bundle packs with exclusive 3D content will be available for ROKiT users later in the year. ROKiT’s target consumers are people who are at a point of change in their lives and may need dependable connectivity and health advice wherever they go. ROKiT devices, offer fast and reliable communication and essential access to high quality healthcare. 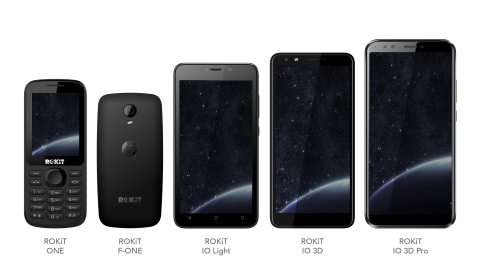 The phased launch of the ROKiT phones will roll out across the world starting with USA, Mexico, Canada, Poland and the UK this year and move into China, India and Japan in 2019. In the next quarter, the brand plans to reveal new handsets featuring cutting-edge naked eye 3D technology. A series of high profile brand partnerships will also be announced, cementing ROKiT’s place amongst the major players in the technology, telecoms and service industry. Now available for preorder on www.rokitworld.com. ROKiT is a humanity first telecommunications business that offers consumers state of the art mobile handsets and wireless connectivity at an unbeatable value. As part of the ROK Group of Companies, ROKiT has been founded by business innovator John-Paul DeJoria (John Paul Mitchell Systems, Patron Tequila, John Paul Pet) and Jonathan Kendrick (British entrepreneur). ROKiT’s core innovation is the brand’s unique combination of device and service offerings brought to market at aggressive, attention-getting price points. ROKiT pledges to provide connection, health, and security for all. Additional information can be found at www.rokitworld.com. ROK Brands was founded by seasoned business innovators John Paul DeJoria and Jonathan Kendrick. The corporation includes ROK Vision, ROK Drinks (ABK Beer, Real Irish Whiskey, Bogart’s Spirits, among others), ROK Water, ROK Stars, ROK Books and other brands. Headquartered in the United Kingdom and Southern California, ROK Brands offers a diverse portfolio of products that improve the lifestyle of mankind around the world. Additional information can be found at www.rokbrands.com.